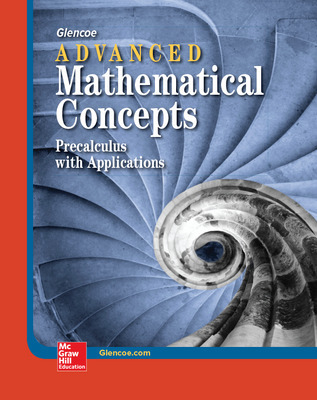 Advanced Mathematical Concepts provides comprehensive coverage of all the topics covered in a full-year Precalculus course. Its unique unit organization readily allows for semester courses in Trigonometry, Discrete Mathematics, Analytic Geometry, and Algebra and Elementary Functions. Pacing and Chapter Charts for Semester Courses are conveniently located in the Teacher Wraparound Edition. Advanced Mathematical Concepts lessons develop mathematics using numerous examples, real-world applications, and an engaging narrative. Graphs, diagrams, and illustrations are used throughout to help students visualize concepts. Directions clearly indicate which problems may require the use of a graphing calculator. A full-color design, a wide range of exercise sets, relevant special features, and an emphasis on graphing and technology invite students to experience the excitement of understanding and applying higher-level mathematics skills. Applications immediately engage students' interest. Concepts are reinforced through a variety of examples and exercise sets that encourage students to write, read, practice, think logically, and review. Internet Connections refer students to the Glencoe Web site, which offers links to additional relevant sites.